The word Clann in Gaelic means "family" and there are hundreds of such groups who organized under the authority of a leader known as a Chief. Those eligible to join the a Clan by reason of family connection, or those who simply wish to be friends of the Clan may do so by recognizing the Chief of that Clan, and strictly speaking, being recognized by that Chief as a clan member. In the context of Scottish clans, Septs (pronounced as ‘set’) are families that followed another family's chief. These smaller septs would then comprise, and be part of, the chief's larger clan. 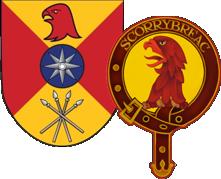 A Sept might follow another chief if two families were linked through marriage; or, if a family lived on the land of a powerful laird, they would follow him whether they were related or not. Bonds of manrent were sometimes used to bind lesser chiefs and his followers to more powerful chiefs. The Original Gaelic form of the name MacNeacail has over 80 variations in spelling. This is due to Anglicising the name after the Jacobite Rebellions, as well as many emigrants from Scotland changing their names on arrival in their new country, as did many people who migrated to the Scottish lowlands in search of work. Shortening or dropping the prefix "Mc" or "Mac", or Anglicising a Gaelic surname, or indeed changing the surname altogether for a similar sounding English one, which would be easier to pronounce and would conceal one’s origins, was common occurrence.